I discovered a new word this year. Well, I guess I’ve known the word for a long time, but this year brought it new meaning. Yeah, I’m sure you know the word as well. Over the past several months, I’ve really begun to adopt this word as my main focal word for running. I’ve tried to be as consistent as possible, and it has really paid off. 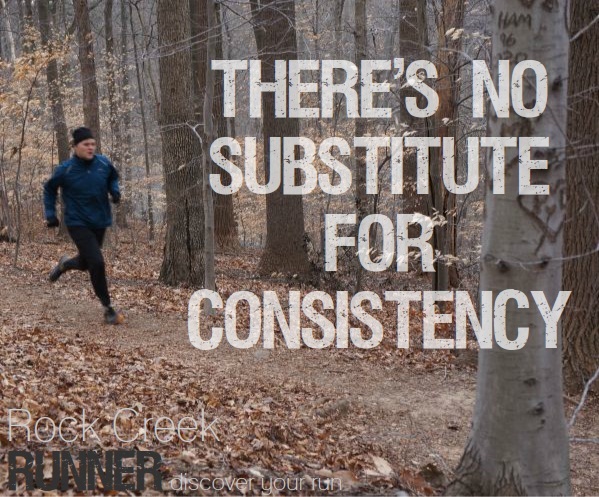 Being consistent is incredibly easy. It just takes a little focus. Since I started running seriously, I have gone through major patterns each year. I train hard for 3-4 months. Cut way back for a month or so. Train hard again for another race. And finally take most of the winter off from any real effort. You know the routine, we’ve all done it. After starting a run streak on June, 17th of last year, that pattern has disappeared. My weekly mileage leveled out, and even though I have peaks leading up to races, I’m staying away from that dreaded fitness dip I suffered each cycle before. Consistent mileage doesn’t mean you have to run every day, but the constant aerobic effort has kept my fitness levels high and my body strong. By avoiding those tough build up months, my body is actually going through less stress, and I’m also staying injury free (knocking on the biggest piece of wood I can find). During the recent Mount Mitchell Challenge, I took a new approach to nutrition. Instead of waiting until my body told me it needed calories or energy, I dumped in as much as it could hold. This started during long training runs leading up to the race. I carried more Gus, and made sure to take them on the 45 minute mark, every 45 minutes. No matter what. My body loved it. It loved the consistent fuel it was getting during training, and come race day, the consistent intake of nutrition meant I ran more or less bonk free. In a recent interview Matt Frazier and I did for No Meat Athlete Radio, our monthly podcast, we spoke to Bryon Powell of iRunFar.com about making the switch from marathon to ultramarathon. Bryon drops tons of great information during the interview, but one thing he said stuck out over everything else. He said that during an ultra, instead of focusing heavily on splits and other racers, fall into that zone that just feels right. Like you could just keep running at that pace all day. Come race day, not even a week after the interview, I thought about what he said over and over again while running up and down that mountain. What I discovered wasn’t that I had a certain mile pace that I could run all day, but that the pace was dictated by an effort. As long as I could keep my effort consistent, I could keep running as long as I needed to. On that particular day, my all day effort resulted in a few 8 minute miles, a few 16 minute miles, and everything in between. But the important thing was that I wasn’t burning out, and I was able to keep up the consistent effort. Forever is a long time, and I don’t take that promise lightly. But it is true. As long as I can continue being consistent, I just know great results will come, and I will forever approach my training with consistency in mind. I’m not just talking about being consistent with mileage, nutrition, and effort, I’m talking about adopting this philosophy in every aspect of my running. Cool part is, I bet it will result in great things outside of my running as well. So what do you say? Can we drop the training roller coaster and start being more consistent together? This post really hit home for me. I was “running” for a long time without any consistency to my schedule, diet, dedication, etc. and not really getting anywhere. Making a commitment to running regularly – and all that it entails – has made all the difference. Thanks again for writing this and reminding everyone of the importance of being consistently consistent!